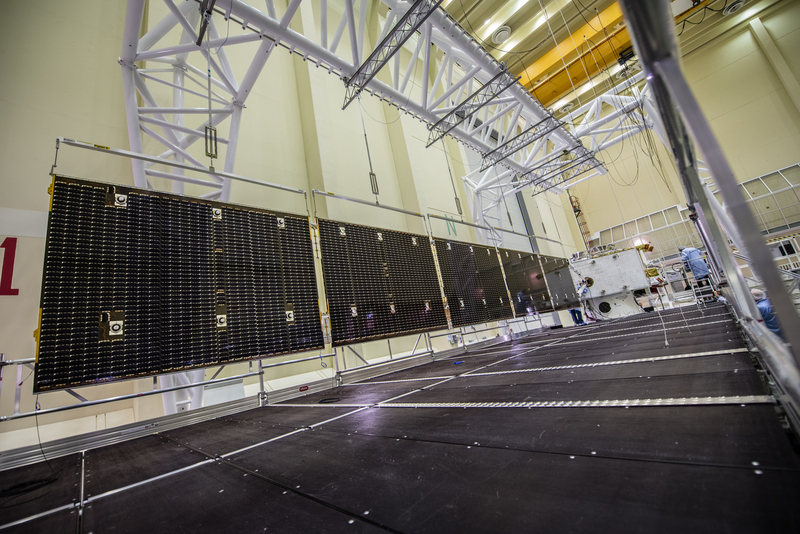 Spanning 14 m from the spacecraft body, this impressive solar wing is one of two attached to ESA's BepiColombo Mercury Transfer Module. The solar wing deployment mechanisms were tested last month at ESA's technical centre in the Netherlands as part of final checks ahead of the mission's October 2018 launch from Europe's Spaceport in Kourou, French Guiana. During testing, the five panels were supported from above to simulate the weightlessness of space. The wings will be folded against the spacecraft's body inside the Ariane 5 launch vehicle and will only open once in space. Mechanisms lock each panel segment in place. They can be rotated with the solar array drive mechanism attached to the main body. Despite travelling towards the Sun, the transfer module requires a large solar array. Temperature constraints mean they cannot directly face the Sun for long periods without degrading, so they have to be angled and thus require a greater area to meet BepiColombo's power demands. The module will use a combination of electric propulsion and multiple gravity-assists at Earth, Venus and Mercury to carry two scientific orbiters to the innermost planet in our Solar System. After the 7.2 year journey, ESA's Mercury Planetary Orbiter and Japan's Mercury Magnetospheric Orbiter will separate from the transfer module and enter to their own orbits. They will make complementary measurements of Mercury's interior, surface, exosphere and magnetosphere. The data will tell us more about the origin and evolution of a planet close to its parent star, providing a better understanding of the overall evolution of our own Solar System as well as exoplanet systems.